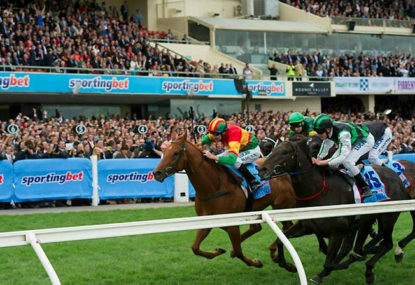 An interesting mix of sprinters, milers and stayers have gathered for a solid contest boasting five individual group 1 winners. Leading the markets, Moment Of Change returns to the site of his first Group 1 win when he took out the Rupert Clarke Stakes 18 months ago. As the only true sprinter in the field, Moment Of Change is the justified favourite but comes in off a disappointing first-up run in the Australia Stakes when he finished 2nd behind Richie’s Vibe a fortnight ago. Prior to that Moonee Valley run, Moment Of Change had an impressive spring campaign but found himself behind another superstar sprinter, Buffering, on two occasions. As a proven weight carrier who is trained at and enjoys Caulfield, he is the deserved favourite over for the season opener. The weight-for-age race has gathered a bit of interest from the younger generation with two three-year-olds entered. Cox Plate winner Shamus Award is well fancied in the market but based on what we saw last year, 1400m is far too short for him. However, he is bred to be a sprinter and has never missed a place running first-up. Shamus Award is being set on an Australian Cup path so he’ll be looking for a solid hit out here but there are much bigger races on his agenda this season. The more interesting three-year-old is the Bart Cummings trained Eurozone. By Northern Meteor, the colt has shown immense talent but struggled towards the end of his spring campaign. At his best, he has form around Bull Point who last week took down Prince Harada and Fast’n’Rockin. Keen trial followers however will have noticed Eurozone’s track gallop a few weeks ago where he was unresponsive when pushed. Under hard riding, Eurozone was comfortably beaten in that track gallop by Benedire who is still a maiden. Foreteller follows a near identical campaign start as he did in spring when he flew home from last to run fifth in the Group 2 Warwick Stakes in a blistering final 400. Foreteller is considered a stayer by most but anyone who remembers that run in the Warwick Stakes also knows how he reproduced that sprint finish in the Group 1 Makybe Diva Stakes over 1600m to roll Puissance De Lune. Versatile enough to win from 1400m to 2400m, Foreteller opened above the odds and is already a WFA winner in Melbourne. Another which deserves respect is Hawkspur based on his proven ability amongst this class. However, he has struggled to replicate his Sydney form in Melbourne which is why Chris Waller has kept him in Melbourne over the summer. He has a poor first up record and prefers softer ground but in all his bad runs, he’s been stuck at the back in large fields so the small eight horse field should enable Jim Cassidy to get through the field much more comfortably than in the past. Of the others, Sertorius has an excellent first-up record and Finishing Card comes in off an excellent run at Flemington to be a sneaky place chance.